Stainless Steel bracket for fitting a Mikuni heater to the bulkhead of a Yacht, motor cruiser or other vessel. Compatible with: MY16, MYE16 & MYH16 heaters. Only compatible with: MX60 heaters. Stainless Steel right angled bracket for securing Mikuni fuel pump. 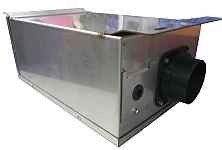 Stainless steel box to encase a Mikuni heater when fitting internally to a vehicle. Stainless steel box to encase a Mikuni heater when fitting externally to a vehicle. When fitted between a Mikuni water heater and its mounting bracket these rubber fittings eliminate any vibrations produced by the heater to reduce noise in the pipe work.